physician , I was told that that it was only a minor sprain and was suggested to use Sombra natural pain relieving roll- on gel. 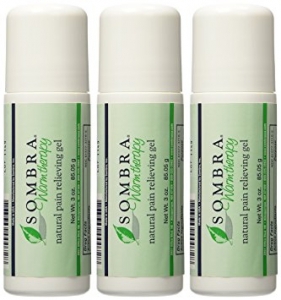 Sombra natural pain relieving roll- on gel was basically a unique formula with special blend of six natural plant extracts in combination with menthol, capsaicin and witch hazel nut which helped to get rid of the pain in a natural way. Since I was using a pain relieving gel with a roll- on model, I had my own doubts about its effectiveness. Applying Sombra natural pain relieving roll- on gel on the affected area for the first 2-3 times ( on the first day) it didn’t quite show any positive results and my pain remained the same. But when I got up the next day, I was rather surprised- as I was now able to move my legs with a little more ease. I was thoroughly relived. relieving roll- on gel not only helped me heal my sprain successfully, but this roll- on also worked wonderfully for my headaches and back aches. Its compact size and easy to use feature (being a roll-on) made it highly convenient for me to carry it in my purse and just use anywhere and everywhere I needed it. Priced at $11.65, Sombra natural pain relieving roll- on gel has now become an important essential in my medical kit and works its magic on anything it is applied to.